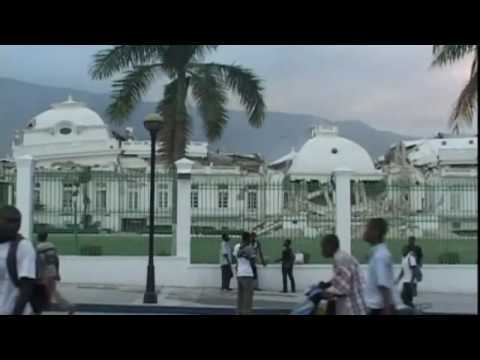 ITN has early video of the earthquake devastation of Port au Prince, Haiti. For a quick overview of the Haitian economy, see this site. It was a sad story even before the earthquake. (courtesy Daniel Morel at twitter; for more, see here. Obviously, the country will need a lot of aid to come back from this disaster. I have an idea. Remember that public TARP money that we loaned to the major Wall Street finance firms? They didn’t actually use it to make small business loans as we had intended. So the supposed geniuses at Goldman, Sachs, who helped get us into our current economic mess in the first place, just picked our pockets for no interest and bought treasury bills? That’s why they deserve bonuses? And what bonuses. “It’s reported that Goldman Sachs, Morgan Stanley and JPMorgan Chase combined have set aside $47 billion for bonuses,” NPR says. Haiti’s annual gross domestic product in nominal terms is about $7 bn. a year. So here is a modest proposal. Since public monies clearly were the basis for a lot of the “profits” the banks and finance houses made in 2009, why don’t the executives show at least a little common decency and donate some significant percentage of it (half?) to worthy causes in the US and abroad. Why not 10 percent to Haiti reconstruction and development? That would be $4.7 bn., and it would go a very long way in Haiti. The US government only puts in about $200 million a year into aid to Haiti. Although Americans tell pollsters that they think we give away too much in foreign aid, it is only about $22 billion, much less as a percentage of our national income than most advanced countries. A third of it goes to Israel and Egypt. Instead of Congress having to borrow money to increase the aid budget to help Haiti, or raise taxes, why don’t the nice folks on Wall Street do the right thing? Just give 10 percent of their bonuses to Haiti. It might help change the public perception of them. In the meantime, all of us who are able to can do our part. Here is the Haiti donation site for UNICEF America’s Haiti relief efforts.